The simplest IoT software and device sensor platform. Terepac has made it easy to give voice to the world and your equipment. Our IoT technology is already at work in cities and manufacturing plants in North America. ONE Water monitors pressure from within municipal water systems using customized ONE Device hardware. The ONE Device hardware securely records and wirelessly relays pressure readings to the cloud via cellular networks. ONE Water lets cities change their Smart Hydrants' sampling parameters remotely as their needs evolve. ONE Machine is a simple-to-deploy, magnetically-attached wireless IoT senser. 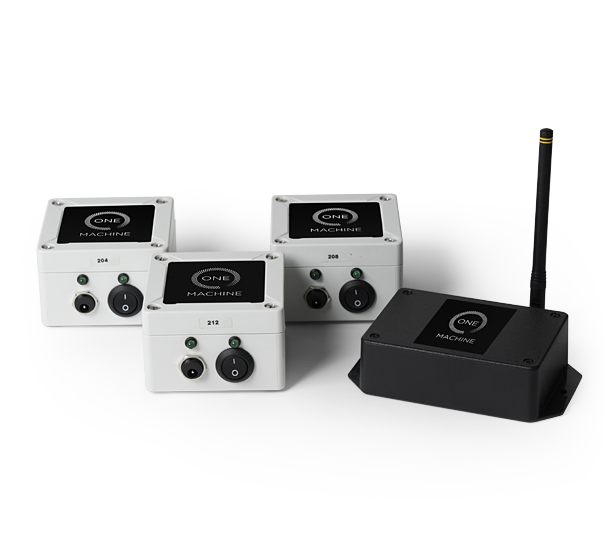 The ONE Device hardware securely records and wirelessly relays pressure, temperature and leak detection telemetry to the cloud via cellular networks. Piezo energy harvesting (similar to the self-winding technology in mechanical watches) converts equipment vibration into power, enabling sensors to be deployed without wires or batteries. ONE Platform is an intuitive and scalable software platform which collects and displays data from any IoT hardware.It is simple to set up and easy to use. It allows anyone from engineers and project managers, to business owners to log into the dashboard from anywhere and monitor device using real-time analytics. The ONE Platform algorithm detects changes in vibration to the thousandth millimetre. Connecting your machine is as easy as turning it on and signing in to ONE Platform. The data sent from ANY IoT hardware to One Platform is encrypted to ensure the highest level of security. Your data is accessible on the devices you choose from anywhere. The Terepac IoT ecosystem has been designed to do the heavy lifting for you. All of the information collected from any number of sensors is instantly displayed on a dashboard that is customized for your decision-making needs. Better information leads to smarter, pre-emptive action plans that give you a greater competitive edge. Connecting your equipment and collecting data is easy when you choose Terepac. Our devices are optimized for quick setup with ONE Platform and can easily attach to your existing IoT hardware. Either way, we make it fast and easy to give voice to the world. IInstallation is easy. If you are working with ONE Water, follow the instructions to retrofit your hydrant with the ONE Water kit (approx 45 minutes). If you are working with ONE Machine, use the pre-installed magnets to attach sensors to any equipment. Turn it On. Our devices will automatically connect to the closest cell tower and immediately begin transmitting data to ONE Platform. View your data. Log into your ONE Platform account and view your data. Our devices are optimized for simple setup so you can spend more time monitoring your equipment and less time setting up your IoT hardware. We’ve designed our platform to scale and integrate at any layer. Our MQTT data collector is capable of handling millions of simultaneous connections from our devices. Data is processed in real time and made available for viewing within seconds. Custom workers can also be created allowing data to be routed directly to a client via a secured VPN connection Whatever the need, we can adapt and scale to fit. We rigorously plan, build and maintain our products to be effective and easy to use. That's what makes Terepac is a pioneer in IoT. Read some of our success stories in our cases studies or check out some of our customer reviews below.